Saving for retirement can be difficult, but if done strategically, it can result in significant tax savings and, over the long run, larger nest eggs for many Americans. That’s something most people desperately need. Nearly one-third of Americans ages 55 and older (29 percent) have no retirement savings or pension plans in place, according to a report from the U.S. Government Accountability Office. Among those who have saved, the median amount of those savings is just $104,000 for households with members between 55 and 64 years old. Max out that 401(k). Workers can contribute up to $18,000 to their 401(k) plans in 2016. Saving pre-tax dollars in a 401(k) helps reduce your federal income tax bill, sometimes by thousands of dollars. Additionally, income tax isn’t owed on those dollars until they’re withdrawn. Because many retirees fall into lower income tax brackets after they stop working, less tax is typically owed on those dollars than would have been paid if the funds hadn’t been saved. Take advantage of catch-up contributions. Once workers hit age 50, they’re able to contribute additional funds to their 401(k) plans—an extra $6,000 in 2016, for a maximum annual contribution of $24,000. This helps pre-retirees not only catch up on retirement savings, but also reduces their annual federal income tax bill even more. Don’t skip the employer match. All workers should aim to save at least enough to take full advantage of their employer’s 401(k) match. Some companies auto-enroll employees at a lower withholding level—say, 3 percent—but offer a match of 6 percent. Double-check your withholding to make sure you’re not leaving free money on the table. 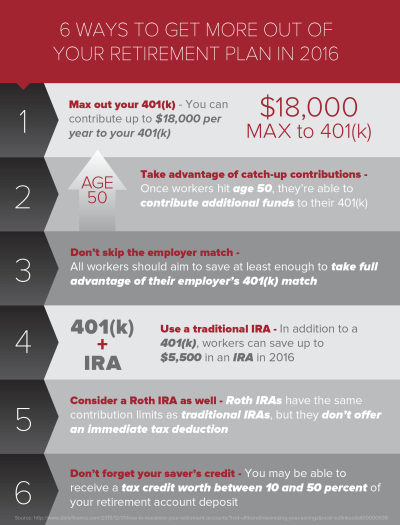 Use a traditional IRA. In addition to a 401(k), workers can save up to $5,500 in an IRA in 2016. (Workers 50 and older can save up to $6,500.) However, individuals earning more than $71,000 with 401(k)s accounts can’t deduct the funds from their taxes, and those earning between $61,000 and $71,000 can’t claim the full deduction. Think about a Roth IRA, too. Roth IRAs have the same contribution limits as traditional IRAs, but they don’t offer an immediate tax deduction. On the plus side, investment earnings in the account aren’t taxed, and withdrawals taken after age 59 ½ are also tax-free. Don’t forget your saver’s credit. If your individual adjusted gross income is less than $30,750 ($61,500 for married couples), you may be able to receive a tax credit worth between 10 and 50 percent of your retirement account deposit.